Martha Berry sends Mrs. Kirk her sympathy in regards to the loss of Mr. Kirk. She says that he has been a wonderful friend, and provided an aid when Mr. Eagen went. 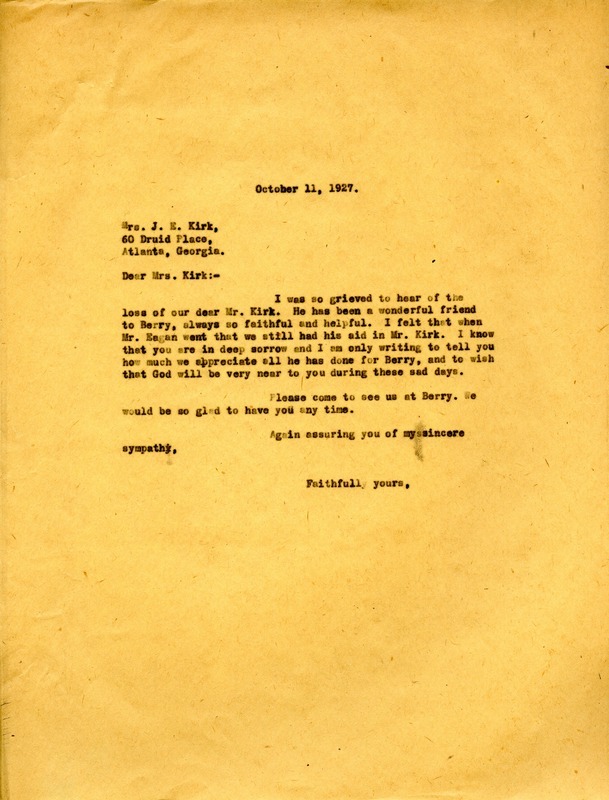 Miss Martha Berry, “A Letter to Mrs. J. E. Kirk from Martha Berry.” Martha Berry Digital Archive. Eds. Schlitz, Stephanie A., Jordan Brannen, Maggie Holman, et al. Mount Berry: Berry College, 2012. accessed April 21, 2019, https://mbda.berry.edu/items/show/4769.